In the 19th century, when outbreaks of infectious diseases were linked to poor urban sanitation, it was recognised that city design affected public health. However, links between planning and health later weakened. Recently there have been calls for public health and planning disciplines to reconnect – this time to create cities that make it easier for people to live healthier lives to reduce their risk of chronic disease. Across the sectors of public health, transport and planning, there is a push to recommend urban design that promotes active travel, public transport, healthy diets, and public open spaces. The creation of liveable and sustainable communities is a priority of national and international urban policy. In earlier work, Professor Billie Giles-Corti’s team identified 11 domains of liveability, based on the social determinants of health, that likely contribute to health and wellbeing: crime and safety; education; employment and income; health and social services; housing; leisure and culture; local food and other goods; natural environment; public open space; transport; and social cohesion and local democracy. This project identified and tested national indicators of liveability to provide evidence for how policies in these domains affect health and wellbeing outcomes. The researchers used geographical information systems to spatially create liveability measures for selected domains. These were then tested with selected health behaviours and outcomes. The policy-relevant liveability measures have been validated with chronic disease risk factors and are now suitable for monitoring progress towards creating more liveable and sustainable Australian cities. This multi-state project identifies a range of state-level urban planning policies related to selected liveability domains (i.e. alcohol, food, public open space, transport, walkability). These were operationalised spatially and tested with selected health behaviours and outcomes. Those related to health are being developed as national indicators to provide policy makers and researchers with evidence for understanding the depth of liveability indicators that affect health and wellbeing. The national liveability indicators are a standard that can be used nationally to measure which built environments work best for health and which don’t. They can also be used to measure liveability differences within and between cities, where progress is being made and where there is room for improvement. The hope is that the indicators will be a tool for anyone involved in creating healthy neighbourhoods, such as governments, developers and public health planners. This project has now been completed. The final outcomes are listed below. The Australian National Liveability Study identified nine liveability indicators appropriate for urban areas across Australia. These indicators are policy-relevant and/or research best practice and have been demonstrated to be associated with health outcomes. These indicators will be calculated for Australian major cities in a subsequent project and will be of use to assess inequities within and between cities, and benchmark progress towards creating more liveable cities. These indicators have generated interest from federal and state government and could be used to create a national liveability performance framework. The findings of the Australian National Liveability Study have been presented to the ACT Department of Health, and discussed with the Cities Division within the Department of Prime Minister and Cabinet. The review of spatially specific state-based urban planning policies relevant to the five liveability domains (alcohol, food, public open space, transport, walkability) revealed policy gaps in the alcohol and food domains. These gaps represent an opportunity for more research in this area to help define appropriate ‘spatial’ policies, and for Prevention Centre stakeholders to advocate for spatially-specific alcohol and food planning policies. 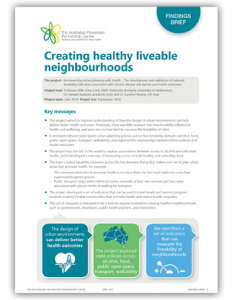 The study revealed that promoting health is not an objective in most planning legislation of Australian states; and highlighted that changing this legislation is a priority to ensure that local government planners have a legislative tool to support them them create healthy, liveable local communities. The process of testing potential liveability indicators yielded innovative methods and research findings. The results from the alcohol domain were the first globally to explore associations between access to alcohol and self-rated health. The food domain developed a new indicator of food access that combined access to healthy and unhealthy foods. The transport domain was among the first health study to examine and demonstrate associations between public transport service frequency and walking for transport. The public open space domain demonstrated that meshblock public open space data may be appropriate for percentage based measures of access, but it is inappropriate for distance-based measures of access and could not be used to bench and monitor policy compliance. This finding is of relevance to all researchers using Australian meshblock land use data to assess characteristics of the environment. Finally, the walkability domain developed novel measures of access to destinations and was among the first to examine associations between the neighbourhood environment and walking in that same environment. These two innovations contributed to stronger associations between a walkable environment and walking than seen in previous research. A number of issues in sourcing consistent, accurate national spatial data were identified during the course of the project. This led to a number of data advocacy activities including two submissions (to AUSTROADS and the Productivity Commission), and the development of ongoing data advocacy activities with data suppliers and vendors. The geospatial team also provided methodological advice to the Australian Bureau of Statistics (ABS), which has since calculated a measure of access to public open space and linked this to Australian Health Survey data. This measure will now be available to Australian Health Survey data users. The team also recommended modifications to the meshblock dataset – to improve the usability of the meshblock land use data for researchers – that will be considered by the ABS for future releases. In undertaking this research, the team was limited by the availability of appropriate health and behaviour data. In order to allow measurement of the residential environment, any health and behaviour survey data required residential address information. Therefore they recognised an opportunity to improve the availability of geocoded health survey data and linkage to liveability and other measures of the environment. Improved data linkage could occur through a number of mechanisms, such as linking liveability measures to the ABS’s Australian Health Survey and/or providing tools to enable linking of health and liveability measures such as a national spatial data platform. Through this project the team sought stakeholder feedback on these options and are now in a position to develop a funding proposal to help address this problem. The project has enabled development of a liveability research network across Australia. In particular, it provided opportunities for early-mid career researchers (research fellows and technical staff) to develop research networks and gain experience in working on a large national project guided by policy and practitioner stakeholders. Giles-Corti B, Badland H, Mavoa S, Turrell G, Bull F, Boruff B, Pettit C, Redman S, Bauman A, Hooper P, Villanueva K, Astell-Burt T, Feng X, Learnihan V, Davey R, Grenfell R, Thackway S. Reconnecting urban planning with health: a protocol for the development and validation of national liveability indicators associated with noncommunicable disease risk behaviours and health outcomes. Public Health Res Practice. 2014;25(1):e2511405. Badland H, Giles-Corti B. Liveability: From local to national. CRE in Healthy Liveable Communities Stakeholder Workshop, Melbourne, Australia. 15 March 2016. Mavoa, S, Badland, HM, Eagleson, SE, Boulange, C, Giles-Corti, B. Developing a measure of access to destinations for daily and local living. Institute of Australian Geographers Conference, Adelaide, Australia. June 2016. Mavoa, S, Badland, H., Eagleson, SE, Giles-Corti, B. Development of a national walkability index: addressing the challenge of land use data. 15th International Society of Behavioral Nutrition and Physical Activity, Cape Town, South Africa. June 2016. Badland B, Roberts R, Butterworth I, Giles-Corti B. How liveable is Melbourne? Conceptualising and testing urban liveability indicators: Progress, issues, and opportunities. State of Australian Cities National Conference, Gold Coast, 6-11 December 2015. Badland H. Conceptualising and measuring urban ‘liveability’. Community Indicators Victoria Local Government Capacity Building Workshop, Melbourne, Australia. 27 October 2015. Badland H. Reconnecting planning and public health: An overview of the National Liveability Study. The Australian Prevention Partnership Centre Early Career Investigators’ Forum, Melbourne, 19 October 2015. Badland H. (Invited Keynote Presentation) Healthy built environments for all: What do we need to consider? Australian Population Health Congress, Hobart, 6-9 September 2015. Astell-Burt T Badland H, Mavoa S, Turrell G, Bull F, Boruff B, Pettit C, Redman S, Bauman A, Hooper P, Villanueva K, Feng X, Learnihan V, Davey R, Chisholm M, Thackway S, Giles-Corti B. Is ‘liveability’ associated with physical activity and dietary behaviours? Developing and validating a set of national liveability indicators. 8th Making Cities Liveable Conference, Melbourne, 6-7 July 2015. Badland H Mavoa S, Villanueva K, Roberts R, Davern M, Giles-Corti B. Creating policy-relevant spatial measures of transport which map to health behaviours and outcomes. International Conference on Transport & Health, London, 6-8 July 2015. Boruff B, Badland H, Mavoa S, Turrell G, Bull F, Pettit C, Redman S, Bauman A, Hooper P, Villanueva K, Astell-Burt T, Feng X, Learnihan V, Collett J, Hurni A, Thackway S, Miller J, Giles-Corti B. The development and validation of national liveability indicators: linking geography, urban policy, chronic disease risk factors and health outcomes in Australia. Institute of Australian Geographers (IAG) 2015 Conference, Canberra, 1-3 July 2015. Giles-Corti B, Mavoa S, Hooper P, Villanueva K, Boruff B, Astell-Burt T, Learnihan V, Badland H. Are ‘liveable’ communities associated with physical activity and dietary behaviours? Developing and validating a set of national liveability indicators. 14th International Society of Behavioral Nutrition and Physical Activity, Edinburgh, Scotland, 3-6 June 2015. Badland H, Mavoa S. An overview of The Australian Prevention Centre National Liveability Study and implications for urban planning policy. Centre of Research Excellence in Healthy Liveable Communities Annual National Meeting, Melbourne, Australia. 13 May 2015. Boruff B, Badland H, Mavoa S, Turrell G, Bull F, Pettit C, Redman S, Bauman A, Hooper P, Villanueva K, Astell-Burt T, Feng X, Learnihan V, Collett J, Hurni A, Thackway S, Miller J, Giles-Corti B. The development and validation of national liveability indicators: linking geography, urban policy, chronic disease risk factors and health outcomes in Australia. Association of American Geographers Annual Meeting, Chicago, US, 21–25 April 2015. Learnihan V Rachele J, Turrell G, David S, Mavoa S, Badland H, Giles-Corti B. Benchmarking policy performance for active living: Developing and validating national transport liveability indicators. Active Living Conference, San Diego, USA, 22-25 February 2015. Badland H. Reconnecting planning and public health: An overview of the National Liveability Study. The Australian Prevention Partnership Centre Governance Board, Sydney, 25 June 2015. Badland H, Mavoa S, Eagleson S, David S, Hooper P, Rachele J, Astell-Burt T, Giles-Corti B. Identifying and validating policy-relevant, national spatial measures of walkability. 14th International Society of Behavioral Nutrition and Physical Activity, Edinburgh, Scotland, 3–6 June 2015. Feng X, Astell-Burt T, David S, Mavoa S, Eagleson S, Murphy MF, Badland H, Giles-Corti B. Beyond ‘food deserts’? Measuring local food environments in Australian cities (abstract accepted). 14th International Society of Behavioral Nutrition and Physical Activity, Edinburgh, Scotland, 3-6 June 2015. Hooper P, Boruff B, Mavoa S, Badland H, David S, Rachele JN, Astell-Burt T, Giles-Corti B. Are we creating POSitive Places for active living through urban planning policy? Developing and validating national liveability indicators of public open space in Australia (abstract accepted). 14th International Society of Behavioral Nutrition and Physical Activity, Edinburgh, Scotland, 3–6 June 2015. Rachele, J.N., Learnihan, V., David, S., Badland, H., Mavoa, S., Turrell, G., Washington, S., Giles-Corti, B. Benchmarking policy performance for active living: Developing and validating national transport liveability indicators (abstract accepted). 14th International Society of Behavioral Nutrition and Physical Activity, Edinburgh, Scotland, 3–6 June 2015. Badland H, Mavoa S, Eagleson S, David S, Hooper P, Rachele J, Astell-Burt T, Giles-Corti B. Identifying and validating policy-relevant, national spatial measures of walkability (abstract accepted). 14th International Society of Behavioral Nutrition and Physical Activity, Edinburgh, 3–6 June 2014. Giles-Corti B, Badland B, Mavoa S, Turrell G, Bull F, Boruff B, Pettit C, Redman S, Bauman A, Hooper P, Villanueva K, Astell-Burt T, Feng X, Learnihan V, Davey R, Chisholm M, Thackway S. Is liveability associated with physical activity and dietary behaviours? Developing and validating a set of national liveability indicators. (abstract accepted). 14th International Society of Behavioral Nutrition and Physical Activity, Edinburgh, 3–6 June 2014. ABC Radio National, 29 April 2016. Giles-Corti B interview: What Makes a City ‘Liveable’? Radio National Health Report, December 2014: How you get to work, your health and are liveable cities really liveable?